Luke : He told me enough! He told me you killed him! It’s been 35 years since I first heard those words and now I see the wisdom in knowing them. As Ben said in the image above, “Many of the truths we cling to depend greatly on our own point of view. Today, January 31st of 2018, a great celestial event occurred. It was a combination of a supermoon, blue moon and blood moon. It was a supermoon because the full moon coincided with or was very close to perigee. Perigee is just the part of the moon’s orbit where it’s closest to the earth. It was a blood moon because when the lunar eclipse happens, it gives the moon a reddish cast. It was a blue moon because it was the second full moon in the month. All of that was true but only from a certain point of view. If you live in say Brisbane, Australia, then it wasn’t a blue moon. You’d see the lunar eclipse there but the full moon was 1 February 2018 and not 31 January 2018. 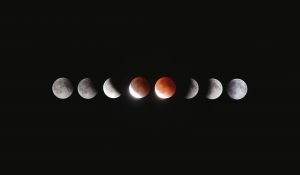 If you live in Iceland, most of western Europe or Africa, or eastern South America, then it wasn’t not a blood moon because you couldn’t see the eclipse. It was still a blue moon though. If wasn’t a blue-blood-supermoon where you were, did it still count? Just because it’s “true” from your point of view, does it make it actually true?